This is an awesome crab fossil. It is a huge Tumidocarcinus giganteus from the Miocene of New Zealand. This crab was found in a very hard, dense concretion, and the concretion has been laboriously prepared to reveal this fabulous fossil - the preparation of this specimen took a full 50 hours! The massive arthropod is extremely inflated and 3-dimensionally preserved. The crab exhibits fabulous detail - the HUGE carapace, HUGE claws, and ALL of the legs are intact and beautifully displayed. This is very rare - usually, only a few of the legs are fossilized. 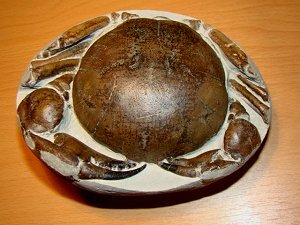 The crab has excellent natural color and anazing contrast and is well displayed in the large concretion. This is a very impressive and collectible specimen of this HUGE fossil crab from Down Under.